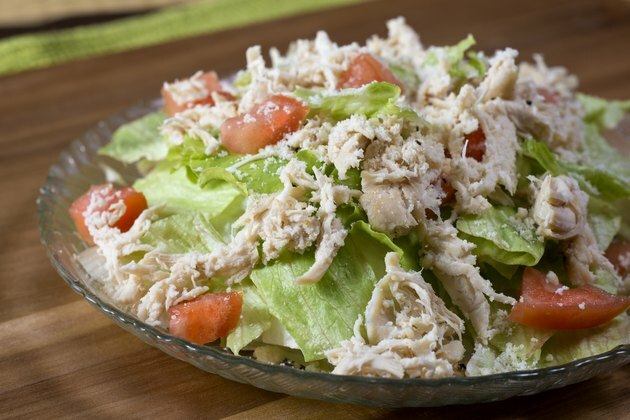 Baking chicken breasts rather than poaching or boiling them helps the meat retain more of its naturally mild flavor, giving you an excellent culinary canvas with which to create your own signature salad. 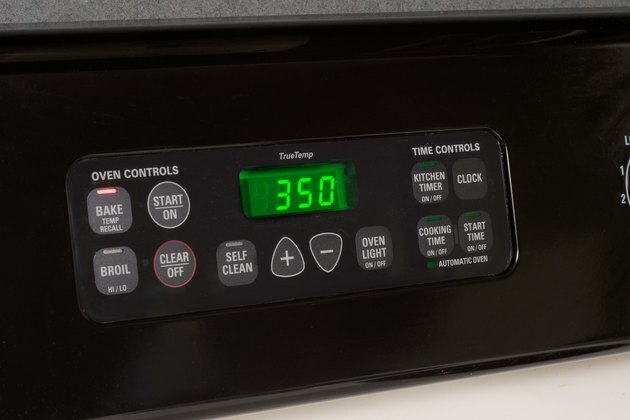 Preheat your oven to 350 F. Coat a baking sheet with a thin film of nonstick cooking spray. Plain is fine, but olive oil mist adds extra flavor. Rinse your chicken breasts in cool water to ensure the freshest possible taste. This is especially important for fresh breasts that have been sitting in their own juices for a few days. Boneless, skinless chicken breasts are simplest to shred, but you can also use split breast with the skin and bones intact. Pat the breasts dry with paper towels. Coat the chicken breasts with just enough olive oil to cover them in a thin film. Use a pastry brush or your fingertips. Season the chicken breasts with a generous amount of salt and pepper. Add other seasonings such as poultry blend, curry powder, turmeric and coriander or chili powder, cumin and thyme for more flavorful chicken salad. 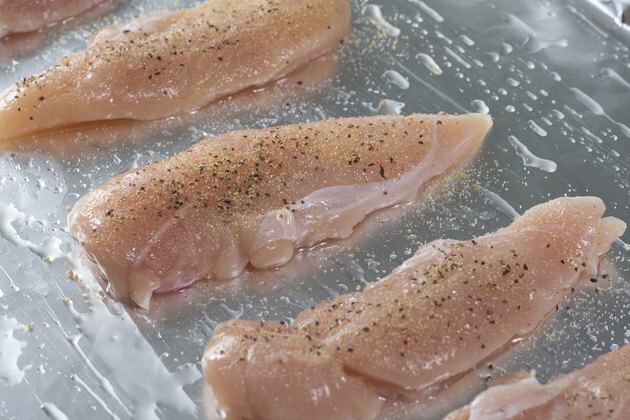 Place the chicken breasts on the oiled baking sheet in a single layer with enough room for air to circulate between them. Bake the seasoned breasts until an instant-read thermometer reads 160 F. This will take approximately 20 to 30 minutes for boneless skinless breasts and 35 to 45 minutes for those with bones. Turn the oven off and let the chicken breasts sit for at least 10 minutes, or until the internal temperature reaches 165 F. You can also bake the chicken breasts until they reach 165 F and eliminate the resting time. The chicken will continue to cook once it is removed from the heat, so this may result in a slightly drier texture. Let the chicken breasts cool and shred them with two forks or your fingers. If using skin-on, bone-in chicken breasts, peel the skin away and discard it before shredding the meat. Marinate the chicken breasts for a few hours or overnight before baking them for a more intensely flavored result. Line your baking sheet with aluminum foil to make clean-up easier. 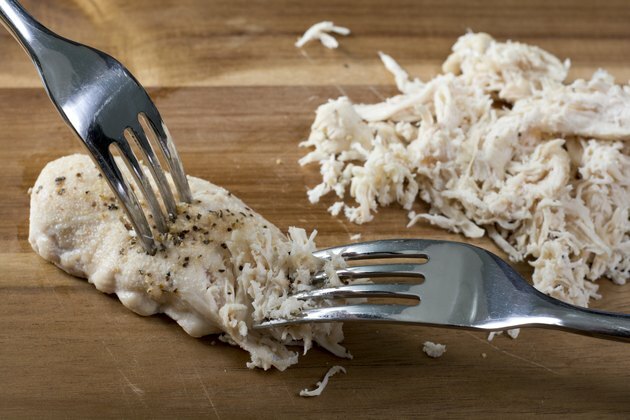 To avoid cross contamination, never use the same utensils for raw chicken as for cooked.